Domey Girl runs in fear through the forest (having being scared off by Angie being murdered) and is followed by butterflies. Julia and Barbie are all happy in bed with her, when cuddling is interrupted by the butterflies being weird. Julia’s not even worried about random insect activity any more. Norrie and Joe are just looooving being Big Jim’s house guest (they notice in passing that Angie is missing but given the givens they’re not shocked that she’s not thrilled to take up Jim’s hospitality offer). Especially with him playing the super nice host. Of course, it’s a ploy to question them about the Dome, claiming he’s become a believer in the Dome after it spared his life. Actually that was Julia, I seem to recall. And I may never forgive her for it. He’s called away by someone reporting random damage but plans to come back to it later. Is there a reason why Carolyn isn’t there for breakfast? James finds more butterflies in the school – and a whole swarm of them on Angie’s body. Yes, Angie is definitely dead. James gets all heartbroken and griefstricken over the body of the girl he kidnapped and held prisoner. I would quite literally prefer to see the grief of ANYONE ELSE in this town rather than James over Angie’s death. At the diner, a woman is praising Jim for his wonderful self-sacrifice saving them all from the Dome – ugh. Why couldn’t Jim have been murdered? Jim’s taken up serving coffee since Angie isn’t working. He offers something coming close to resembling a thank you to Julia but both she and Barbie are pretty clear how much Jim is not their favourite person. Rebecca runs in to warn Jim that all the pretty butterflies cause lots of caterpillars which, in turn, eat all the things. Conversation interrupted by bloodstained James’s arrival. They go check out the body and Jim tries to get Barbie on side to help. New Sheriff Phil kind of hovers, but he does find a bloody footprint. In the woods, Joe and Norrie are being all couply before they’re rained on by dead butterflies – but Joe points out that there will be more, if they’re dying that means they’ve just laid a ton of eggs. Rebecca still seems to be the only one who has realised this is a problem. They also run into Domey Girl! Who talks – to say she doesn’t know her own name. They take her back to town, outside the school where Barbie has to tell Joe about his sister while the rest of the town avoids looking at him. Oh hey community where Joe grew up, way to leave the bad news to a stranger! Classy of you. They take Joe home and Barbie comforts Julia (and hey, someone remembers Linda is dead!) since she’s upset because she thought the dome was supposed to protect them. Uh… since when? 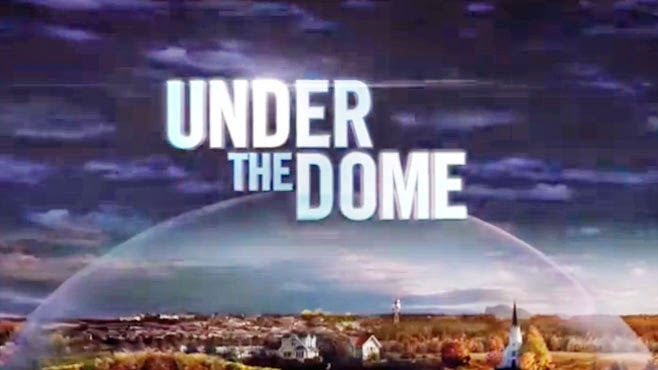 You wouldn’t be in danger if it weren’t for the dome – I don’t know where you get all these big, positive happy feels for it? She also tells Barbie about rescuing the Domey girl since she’s come with Joe and Norrie. Barbie is suspicious since the footprint found near Angie’s body was a girl’s (Domey Girl in fact) and it’s odd that no-one recognises her (he bases that on his sample size of… one, Julia. She counts as everyone now). Julia thinks it’s dubious to accuse Domey Girl of murder – damn it, Barbie, you made me agree with Julia. Accusing Domey girl of murder is interrupted by a huge plume of smoke, Rebecca is burning a field. The owner of that field isn’t pleased but she says they have to to save them all. Joe grieves, Norrie tries to help, but like Norrie when her mother died, he’s too angry for comfort. He wants vengeance. Norrie has also randomly decided that Domey Girl is suspicious for REASONS. She also knows about the shoeprint because no-one’s even trying to keep evidence secret. Joe and Norrie take Domey Girl’s shoe to Phil who declares it a match and has her arrested, to Julia’s loud protests. Joe and Norrie tell James who quickly leaps off the deep end and tries to get Joe to agree to murdering Domey Girl. Yes, Jim now has a messiah complex. Oh gods why couldn’t he have just died?! Barbie finds this super creepy, Rebecca isn’t a fan but since people listen to Jim it’s definitely in the “needs must” category. Also in that category is finding a plan to destroy the caterpillar eggs without burning half their food. Which involves a plane full of pesticide. But who to fly it – well Barbie apparently has military training in flying a plane (which is apparently something you get from the Army?) but Jim demands to do it because he is MessiahJim! Rather than let Jim take the plane up despite Barbie’s greater experience, Barbie gets in first. In a moment of astounding hypocrisy, Jim actually accuses Barbie of acting out for the town to see. Of course this isn’t helped by Barbie playing Big Damn Hero (and big damn fool, risking destroying their only plane (only saved because Big Jim knows about a hidden fuel tank on the plane from his old drug smuggling days). Barbie goes full on “Jim Saved my life” oh gods no. Barbie and Julia debate on many issues, Jim’s messiah complex, Rebecca SCIENCING everything and Julia’s odd belief that the Dome cares about them. And Julia decides she’s losing Barbie and his trust (which bemuses him – he asks whether he has to agree with her and her freaky Dome religion for him to be on her side. Fair question Barbie, but really it’s the writers clumsily prying in that love triangle by hook or by crook). At the funeral and Rebecca declares herself a dedicated member of the damn Jim fanclub for no bloody reason except THIS SHOW. Also she decides Jim should totally go to the funeral even though Angie’s only living relative, Joe, doesn’t want him there. Classy Rebecca. Really freaking classy. James finds Angie’s missing blood stained bracelet under his bed – so goes to see Sam to say he thinks he killed her. Good enough for me, get the scaffold! 2 weeks? You’re telling me the entire first season happened in 2 weeks? 2 weeks? That’s like an episode a day?! How did everyone lose their ever loving minds and come up with all these shortages in TWO WEEKS? They must have run out of insulin in like 4 days! Also, doesn’t that mean that Julia’s husband is only 2 weeks dead with her merrily rolling around with Barbie (her husband’s killer?) Far be it from me to think someone should be in mourning for years before moving on, but can’t you let the body get cold first? In fact, 2 weeks makes everyone’s reactions off. Norrie seems to have recovered from the death of her mother very quickly, for example. It’s actually kind of sad that all the people saying “oooh pretty butterflies” all the time haven’t realised that butterflies come with caterpillars. Is this Rebecca’s role? Being the one brain in town? Lots of people are really upset by Angie’s death – which is good, her death is not ignored. Like Linda’s. Hey, remember Linda? She died. Pretty much no-one noticed. Carolyn, oh Carolyn, where are you Carolyn? Oh the plot hole has eaten you again. Also things I don’t care about – Domey Girl, random Domey Event of the Week, Julia and Barbie… actually pretty much everything on this show.